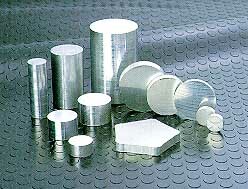 Due to growing demands for environmental protection and decreasing weight of automobiles and other means of transportation, aluminum has become a material of ever-increasing importance. We have filled the needs through its development, production and sales from raw materials (continuously cast rods and extruded stock) to forging, utilizing its global network consisting of three production sites in Europe, Southeast Asia and Japan. Shotic® small-diameter cast rods (diameter 25 – 80 mm) are manufactured by the unique Hot Top Continuous Casting Process without a large-diameter billet extrusion process. Shotic® has successfully realized fine-grain and homogeneous metallurgical structures owing to powerful cooling in the solidification process and Showa Denko K.K. process know-how. We supply standard extruded alloy stock, such as 2000, 4000, 6000, 7000 series, and have developed alloys conforming to customers’ requirements. Wear-resistant and hypereutectic Al-Si alloy of A390, which normally does not render itself very well to continuous casting or forging, has successfully been applied to forgeable rods thanks to our unique continuous casting process. We also have developed and supplied our own eutectic Al-Si alloys, AHS™ series, as wear-resistant and high-strength alloys. Furthermore, we supply cast and extruded stock for forging and bar-machining in the forms of a rod, blank, and, for cold forging, lubricated blank.